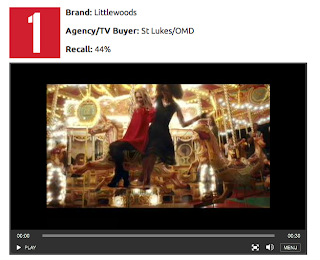 St Luke's Blog: Ding - we're at the top of the charts with Littlewoods Funfair! Ding - we're at the top of the charts with Littlewoods Funfair! 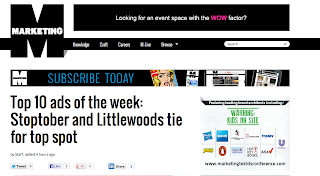 We're delighted to have tied at the top spot in Marketing Magazine's Top 10 ads of the week. The chart of ads is based on those which are most highly recalled for that week, and our delightful Funfair advert and its respective 10" cutdowns have raced to the top of the chart with 44% recall, alongside the anti-smoking campaign Stoptober. We've received great feedback in industry press and on social media for the campaign, which you can watch below featuring Myleene Klass, Mark Wright and a track from the up and coming singer Arlissa.